In his last dhamma talk for 2016, Ajahn Brahm asks us to reflect back on the year. Have you lived up to expectations? Have you set your goals for 2017? Have you written down how you intend to improve yourself and your life? Ok, now throw it in the bin! That's right, if you want to be happy the best way to do it is to lower your expectations to the point where you are happy with yourself and what you have right now. So stop judging and start loving with your imperfections and those of others too! Ajahn Brahm gave a sound introduction to meditation for the beginners that were present on Tuesday 27th, along with his customary jokes and stories. He guided us through meditation then regaled us with a story "Old Monks Don't Lie" to guide us away from the arrow of wanting. Having just returned from a pilgrimage to the Buddhist holy sites in India and Nepal, he talks about the spiritual dimension of pilgrimage. This is not just a travelogue, but rather talking about the ancient tradition of pilgrimage - something Buddhists did before any other religion got the idea - as a source of inspiration to propel us along the path towards Awakening. Ayya Vayama discusses how to relate to various kinds of thinking through mindfulness and understanding. Ajahn Brahm starts this dhamma talk with the humourous story about the monk and the tiger, which explains why monks don't run. He goes on to talk about the benefits of humility and learning from our mistakes. And also he talks about generating energy, especially when we start to get tired. Getting calm and peaceful in meditation is nice and a good outcome from meditating, but as Ajahn Brahmali explains, the aim of meditation is to get in touch with something very profound inside of us and to transcend this world. Ajahn Brahmali talks about how to give rise to a sense of joy and happiness in meditation that can take us to a higher level in meditation. 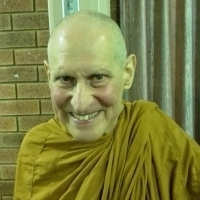 Ajahn Brahmali discusses the place of Buddhism in the context of modern secular society. This talk looks at how as Buddhism comes to the West that it offers an opportunity to look at Buddhism in a historical context and to see what is the essence of Buddhism and what are the cultural accretions that form around that essence. He goes on to also talk about how there is a risk of Western culture diluting the essence of Buddhism. This is what Ajahn Brahmali identifies as "secular Buddhism" developing in the West, which has some useful practices and some that are potentially harmful to the essence of Buddhism. 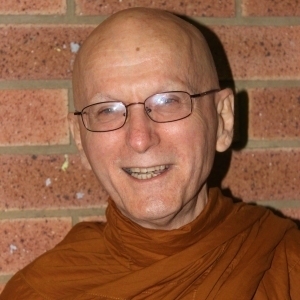 Ajahn Brahm tackles the morally complex issue of euthanasia with fine-tuned Buddhist wisdom. Given that the Four Noble Truths of Buddhism deal with suffering, one can be forgiven for thinking that Buddhist's have a pretty miserable attitude to life. However, as Ajahn Vayama explains, really what the Buddha was teaching was the pathway to achieving ever greater levels of happiness in life. 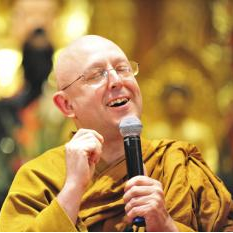 Using recent findings from the fields of psychology and sociology, Ajahn Vayama discusses the Buddhist understanding and practices that are aimed at creating happiness and how research methods are increasingly validating Buddhist teachings and practice. Here's the meaning of life: "Life is a sexually transmitted terminal disease". But is that all there is to it? Ajahn Brahm offers a deeper perspective on the question of "what is the meaning of life?" And rather than the meaning being 'out there' to be discovered, it is rather the meaning that we give to our lives. Responding to a question on how to stay calm amidst conflict, Ajahn Brahm extends his response further by talking about how tranquility can help us to see more deeply into the causes and nature of conflict, and also how tranquility itself can be a key component of resolving conflict, whether its at the small scale with a family or amongst friends, or on a broader scale in the community. Ajahn Nissarano uses the perception of kindfulness and of being our own best friend to set up the frame of mind for meditation. Ajahn Brahm talks about the factors to be considered when going about making difficult decisions in situations where there may be conflicting ethical imperatives. 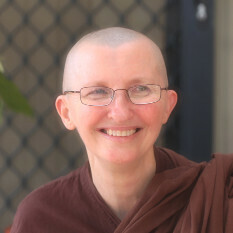 Ajahn Brahm doesn't tell the audience what decision to make when it comes to contraversial ethical issues, but rather offers the listener a guide to how to make the decisions wisely and ethically. Ajahn Brahm talks about the relationship between compassion and stillness (peace in meditation) in that when one is more compassionate and kind to others, this often strengthens our own spiritual qualities, including stillness. Venerable Upasama has started teaching and will be a most welcome teacher at The Armadale Meditation Group. Venerable gave a Dharma Talk on the teachings of Buddha, then an excellent meditation and concluded the night by making us all laugh. Using the analogy of a bush fire, Ajahn Vayama explains how to put out the fires of suffering in our lives. The problem many people have with meditation is that they try so hard and try the wrong way. Ajahn Brahm explains how to have nice meditation by stopping the trying, and just letting go. Western society is caught up with the idea of punishment that we often condemn ourselves with guilt, and seek to punish ourselves for perceived wrongdoing. Ajahn Brahm says to hell with this punishment and advocates taking a kinder, more loving approach to the people in our lives, especially ourselves. Ajahn Brahm leads the guided Saturday meditation class on 3rd December 2016.